and then things get busy once again. But...I think that's normal for this home school mama! books to arrive in the mail. trying to get a head start on food prepping for my hunters! They'll be in and out hunting next month. 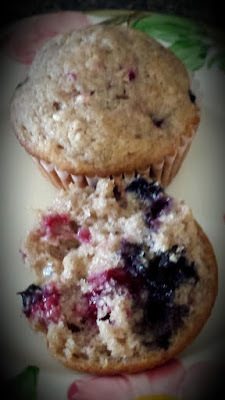 and they were a huge hit! Raspberries and Blueberries from our local farmer's market. I thought you might... So here it is! and lightly spray with cooking oil. Next, mix all your dry ingredients in a large bowl. Stir in your eggs, milk and melted butter. Fold in your berries of choice. sprinkle the tops with cinnamon sugar if desired. These muffins were so moist and delicious! We have an abundance of berries, and I will most certainly show this to my daughter Peyton! Have a cozy week...We will be taking down our summer decorations, then giving the house a good cleaning before bringing out out fall things!!!! Those muffins look wonderful! For the next couple of days we are going to have fall like weather. That means I will be outside most of the time. I am working on weeding and if I can get to it I will start to put the garden to rest. It has given about all that it can! 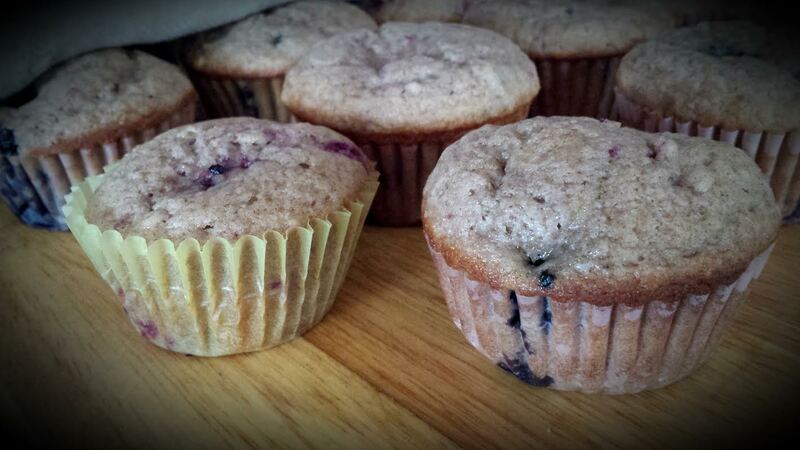 These berry muffins look utterly too delicious for words...perfect for summertime munching! Enjoy the rare quieter days that come in between the busy ones...sending love and smiles your way! And...thank you for your dear comment on my blog this morning...how I love having you stop by! Peyton just pulled these out of the oven! I had to try one! May I link to you when I post a picture? Oh these do look absolutely scrumptious, and so full of yummy goodness! I do love a good muffin recipe, and will be giving your recipe a try! Your hunters will really be enjoying these I'm sure! Will you be going with them, or keeping the home fires burning? Lots of work either way! And so rewarding to have the freezers full of food! Hugs to you today dear friend! Have a blessed Labor Day!